Mead is, in its most basic form, fermented honey, water and yeast. And, despite confusion on its placement on the beer-and-wine spectrum, it is making its way into popular beverage circles, including in Washington, D.C.
Who drinks mead? At a recent tasting event at the Hill Center, drinkers ranged from grey-haired gentlemen, to suit-wearing young professionals, to flannel-clad 30-somethings. Charm City Meadworks has paired with Sona Creamery, the restaurant and creamery on Capitol Hill , to introduce attendees of the hourlong tasting to the sophistication of mead and how it can complement fine cheeses. The Original Dry was paired with a Ewephoria pasteurized sheep’s milk cheese from the Netherlands that carried a “marshmallow-ey flavor,” according to Sona’s owner, Genevieve O&apos;Sullivan. Lure of the Honey Geffken got hooked on the industry by Charm City’s co-owner, James Boicourt, who studied beekeeping and quickly realized the potential in selling the liquor. Geffken is an engineer by trade, though he had some small-business know-how from his now-wife, Katie Geffken, who owns the fitness studio Biker Barre on Capitol Hill. Maryland became the meadery’s home particularly because of cheap warehouse space. The Charm City name and logo followed suit. The meadery has six varietals, three still and three draft, and from start to bottle, each type takes about six months to produce. They get their honey from bees in Lancaster, Pa., and go through about 10,000 pounds of it every six months. Their products are available in about 20 locations in the District, whether on draft or bottled for purchase, like at DCanter or Schneider&apos;s of Capitol Hill. Some meads, such as their Wildflower mead, is like a “cross between a cider and a champagne,” Geffken explained. Some are more beer-like in their style (carbonation, lower ABV) and others more wine-like (still, a bit higher ABV). He said Charm City tries to separate the two, seeking to appeal to the beer drinkers and the wine lovers. Geffken and Boicourt started their work about two years ago and this past November, Geffken said he was able to quit his day job and move full time into meadmaking; It was a signal of the company’s growth, he said. “As a comparison, the mead industry is where the craft beer industry was in the early 80s,” said Jeff Herbert, the publications director of the American Mead Makers Association. According to AMMA’s research, there are about 8,500 wineries in the United States and about 220 of those make mead, Herbert said. There are then about 150-170 establishments that refer to themselves as meaderies. It’s federal and state regulations that are stunting growth and breeding some consumer confusion, both Herbert, who is in Arizona, and Geffken said. Meaderies are first considered, for most regulatory purposes, wineries (think honey wine). Breweries need to have grain in their products and mead doesn’t include grain. But honey is not just sugar, yeasts used can be wine yeast or otherwise, and mead can be carbonated and stored in kegs. According to Herbert, because meaderies make up such a small portion of U.S. wineries — about 2 percent — their needs aren’t truly considered by most wine organizations. In the District, there’s also some menu confusion as to where to place mead. Boundary Road lists it with its beers. Beuchert’s Saloon lists the Charm City Elderberry mead under sparkling beverages. Hank’s Oyster Bar on the Hill has their selection under saisons, sours and fruits. Sona lists it under ciders and Daikaya lists the same Charm City Rosemary mead under white and roses. Doi Moi and Estadio, however, have cider and mead sections on their beverage menus. 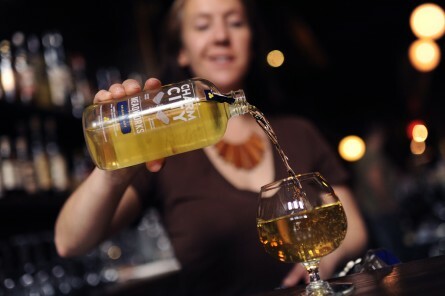 Max Kuller, the wine director at both establishments along 14th Street Northwest, said the versatility of mead and ciders make them a natural fit. At Doi Moi, he said meads are very "friendly to Southeast Asian cuisine," notably with the "funky spice, the fiery side of the food. Things with residual sugar tend to work really well." He loves Charm City&apos;s selections and also pointed to Millstone Cellars in Monkton, Md., for solid ciders and meads. "On top of [pairing well with food], there are just amazing things going on in both of those worlds, coming on all the heels of the success that craft brewing has had," Kuller said. Herbert at AMMA said he’s noticed craft beer fans are drawn to mead, perhaps because of the novelty. “The craft beer mentality really translates and is shared by people who are a fan of mead,” he said. "People like mead and our customers, they are always excited to have the next cool flavor.” The most popular product at his Superstition Meadery is a flight, he added. Geffken echoed him, noting during the tasting that Charm City is really trying to create dry meads and then infuse them with interesting, but not overpowering, herbs and spices. “Beekeepers, brewers and, of course, cheesemakers — they are some of our favorite people,” Geffken said.